An important first step for strong, healthy seed and plant propagation is controlling soilborne weeds, pests (excellent for common fungus gnats), molds (damping off) and disease efficiently, safely, and chemical-free in soil, finished compost, potting mix, and other growing media. 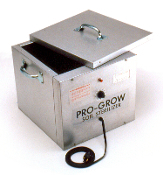 These Professional Grade Electric Soil Sterilizers, used by successful growers and research labs around the world, are designed to have an adjustable temperature range of 140-200 degrees F. Pro-Grow's unique proven design and materials selection is important for heating throughout, finished mix falls straight down through bottom, easy cleaning, and open drying design for mold prevention and longevity of equipment. Many plant pathogens can be found in soil, peat, and sand and when greenhouse crops are planted where these exist, disease may begin because nutrients leak from the plant roots and stimulate pathogens into activity. Pasteurizing with Pro-Grow's SS & SST models is an effective and efficient option for controlling the quality of your growing mixes by eliminating various soilborne pathogens, unwanted common pests (i.e. snails, fungus gnats, and eggs), and weed seeds BEFORE planting your seeds, seedlings, and cuttings into them. Pasteurization to destroy most organisms is done by applying heat until the soil reaches 180-190 degrees F for 30 minutes. After pasteurizing, selected beneficial amendments and supplements can be added for customized growing mixes. For larger bulky materials (i.e. long fiber materials such as unmilled Sphagnum moss), Pro-Grow's XP models are specially designed with extra wide openings and are popular with Orchid Growers. Minimize your exposure to toxic chemicals and incorporate into your greenhouse operations today with Pro-GrowTM, a trusted brand in manufacturing heavy-duty horticulture products in the U.S.A. for over 30 years. Click on the pictures below for more details..and welcome to Pro-Grow's full line of durable Soil Sterilizers! Successful growers control the quality of their growing mixes with Pro-Grow Heavy-Duty Equipment, a trusted brand for horticulture equipment for over 30 years.